Want to increase your Facebook fan engagement? Have you considered adding games to your Facebook page? Facebook games engage people’s competitive nature and can grow your brand’s reach. This article shows you how to use games in your Facebook marketing. If you want to get people interested in your fan page, make your fans a part of your social marketing strategy. People love to see their names in lights, so give them that chance with a Facebook photo of the week contest. The great thing about this type of contest is that it’s easy to implement. Just ask your fans to submit a picture based on a theme you choose, then judge the photos and select a winner. When you’ve chosen a winner, showcase the fan and his or her picture on your cover image or highlight the photo in a status update. The winner gets bragging rights and will probably want to share the excitement with friends. When the winner shares with his or her friends, your page goes out into their news feed and introduces you to a new audience. That can lead to a jump in viral reach. Walmart is particularly good at this. They ask fans to submit a photo via a tab on their Facebook page, which means fans have to go to the Walmart Facebook page and engage by clicking through to the app. 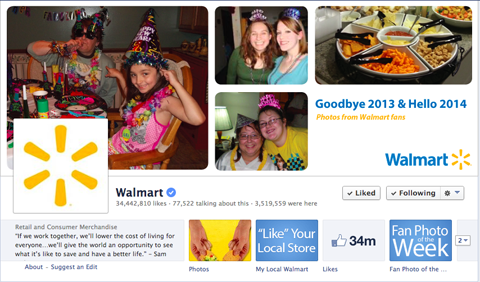 Walmart rewards fans by showcasing them on the cover image. The app form is quick and easy to fill out, so fans are more likely to enter. After they enter, Walmart judges the pictures and chooses a winner. The fan who wins is featured in the Walmart Facebook cover photo. Walmart could add more incentive by offering small rewards or discounts based on how many times a person has entered the contest. Add a more competitive level to the contest by letting the public vote for their favorite photo to win. This encourages even more people to engage with your Facebook page. Set up levels of fan photo achievements, like a badge, to reward the most active participants and encourage repeat entries. Give a shout-out to contest winners by profiling their images, names and stories as an update. It’s very likely the winner will share it with friends and create an even larger viral reach for your page. Use a third-party app on Facebook to make voting easy (and to collect more data from entrants). Photo showdowns are similar to fan photos of the week. Both ask fans to submit photos, but the difference is that showdowns allow other fans and friends to vote. The winners move on to the next level. Amazon hosted a Gladiator Showdown on Facebook where entrants competed for a 10-day trip to Italy to run in the Rome Marathon. 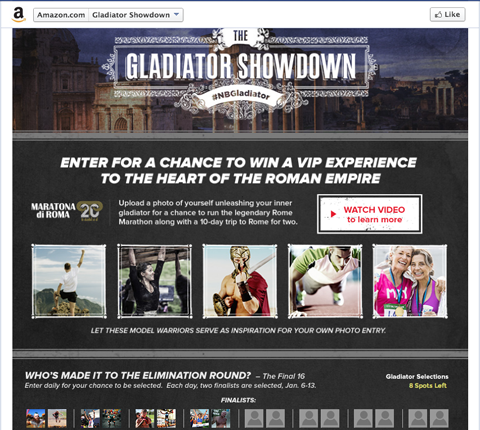 Amazon created a gladiator-themed photo showdown to encourage consistent fan page engagement. Each day, fans uploaded their best gladiator-themed photos and Amazon chose the winner to move to the next round. When the final 16 entries had been chosen, fans and friends had one week to vote for their favorite photo. Amazon chose 16 finalists for the elimination round, then public voting began. Create a fun, competitive theme with elimination levels. Make your contest time-sensitive to encourage fans to come back regularly to check their progress. Capitalize on popular events such as March Madness, Wimbledon and the Super Bowl. Host the contest directly on Facebook, and cross-promote it through all of your social and traditional marketing channels.